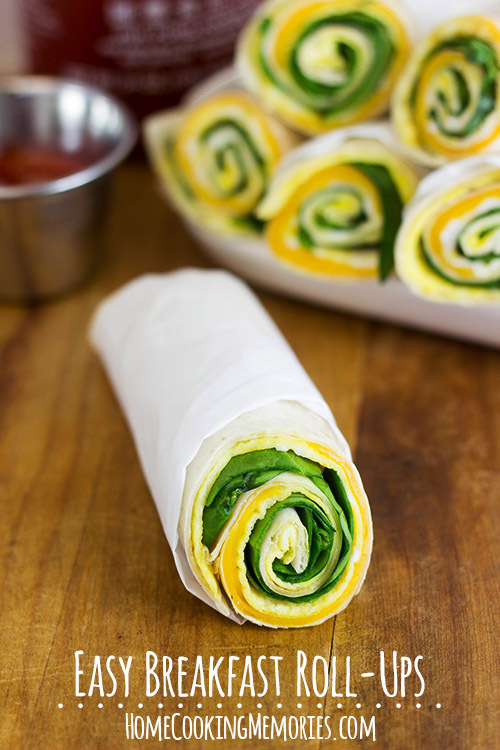 Easy Breakfast Roll-Ups are a versatile breakfast idea that’s perfect for taking on-the-go. PIN this photo to your BREAKFAST BOARD on PINTEREST! One of the popular breakfast ideas in our house is breakfast burritos. Whenever we take a road trip, I usually make a bunch of breakfast burritos up the night before so they are ready to go in the morning — usually to be eaten in the car. But here’s the thing — you would not believe the amount of egg I find on the floor of the car once we get to our first stop. I mean, I get it…I don’t load down the burritos with a bunch of cheese (which would help keep the scrambled egg together). They get munching on their burrito and a piece or two of egg tries to escape. It rolls right on down to the floor, sometimes where it’s not easy to find. All of this inspired me to make Easy Breakfast Roll-Ups. We still have breakfast burritos (seriously, nothing can make me give them up), but I thought how nice it would be to have a “breakfast burrito” style breakfast, with less mess. As you’ll see, these Breakfast Roll-Ups are pretty much the same idea as a breakfast burrito — tortilla, egg, and whatever additions or toppings you would like. 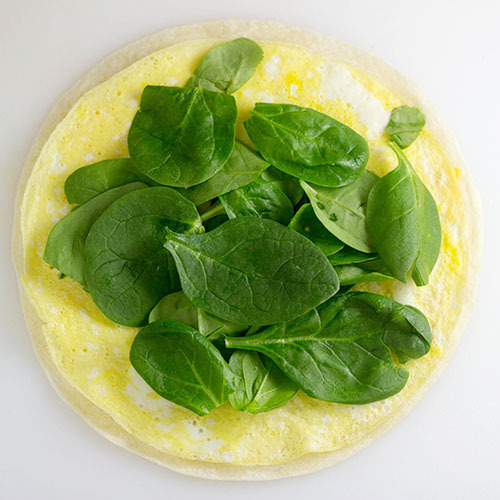 But while they are similar, the egg is cooked flat, rather than scrambled, which makes them much more portable, less messy, and a lot easier to dip, all of which makes them a great option for kids. 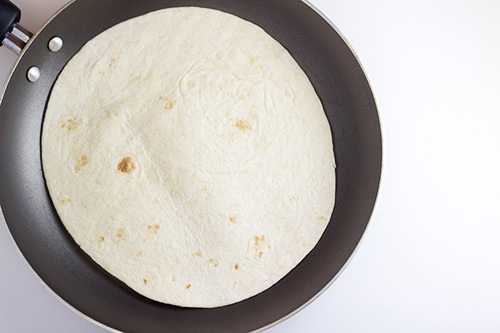 One of the important keys to making your own Easy Breakfast Roll-Ups is having a tortilla that fits the bottom of your pan (as you see in the photo below). The diameter of the bottom of your pan is going to be the diameter of the egg you cook and you want the egg to be pretty much the same size as your tortilla. For our Breakfast Rollups, I used a Farberware 8″ Non-Stick Skillet with a soft taco size flour tortilla. After the egg is fully cooked, use a heat-resistant rubber spatula. I *love* my OXO Good Grips Silicone Spatula – it’s heat resistant up to 600 degrees F, and easy to go around the edges, making sure nothing is sticking. You’ll use the spatula to help remove the egg from the pan too. For the Breakfast Roll-Ups I made in these photos, I put two thin slices of sharp cheddar cheese in the middle of the tortilla. I like to put this down first so that the egg (which will be placed on top of it) will melt the cheese. With the help of the rubber spatula, slide the egg out of the pan and directly on top of the tortilla (and cheese, if you are using it). You can add some other toppings, if you wish. I put some baby spinach on ours, but you could also add more cheese, bacon, crumbled sausage, mushroom, avocado…pretty much whatever you like. Don’t go crazy though — make sure not to add too much of your toppings or you could have trouble rolling up your Breakfast Roll-Up. Next, roll up your Breakfast Roll-Ups. If you wish, you can cut them in half. I also like to wrap them up in some foil, a napkin, or even parchment paper. One of the things I like the best about Breakfast Roll-Ups is that you can dip them easily into hot sauce, salsa…or my son’s choice: ketchup. And, of course, there is no egg falling out when you are dipping. In a small bowl, beat together egg and water/milk until combined. 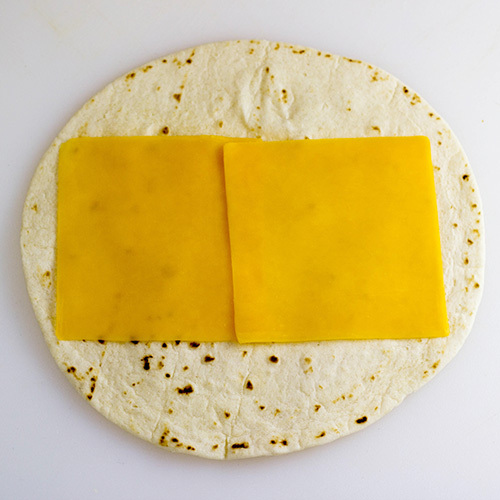 Lay tortilla out on a plate, top with cheese, if you wish to use. Spray a pan with cooking spray that has nearly the same diameter as the tortilla. Heat pan over medium-low heat and pour egg mixture into pan. Gently tilt or swirl pan to ensure that liquid egg covers the entire bottom of the pan. Continue to cook until egg is cooked and no longer liquid. Season with salt and pepper. 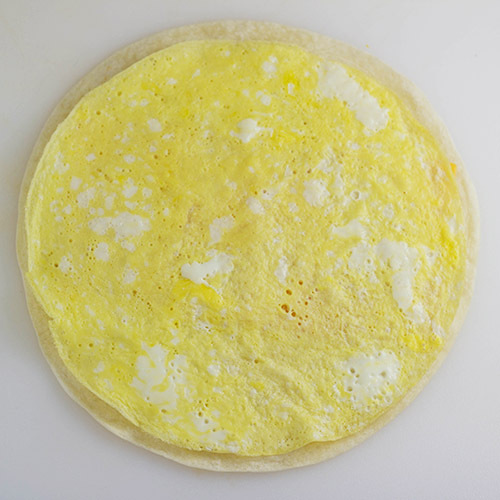 Using a heat-resistant rubber spatula, help slide cooked egg directly on top of tortilla/cheese.Top egg with optional fillings. Roll up tortilla somewhat firmly, but without tearing tortilla or shifting ingredients. 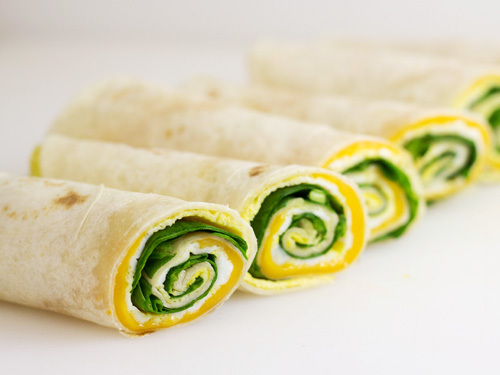 Cut roll-up in half and serve. 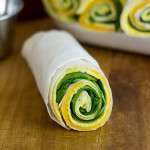 I wanted to mention that while I call these “Breakfast” Roll-Ups, these are great for an easy dinner or lunch. You can’t beat a dinner made in 15 minutes or less! 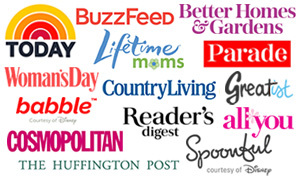 I’m also partnering with other food bloggers who are sharing their own quick recipe. Today we are all sharing recipes that are 15 minutes or less, whether it’s a smoothie, holiday dessert, or a quick snack. Having a bunch of recipes that only takes a few minutes in your recipe tool box is good thing! Need more quick 15 minute recipe ideas? Check out these other great #15MinuteSuppers! These remind me of a Ugandan Rolex “Roll-Eggs” – classic street-side staple in Uganda. You normally add finely diced onion, bell pepper and tomato into the egg mix, and use chapati instead of tortilla (and no cheese!) although when I’m making at home I often use tortillas as a substitute. What a great “on the go” breakfast idea!! These look so yummy, I have pinned this to my “Good Eats” board. Thanks for sharing! I found you at “Made by you Monday” link-up and glad I did! Awesome idea! I’ll have to try out on a weekend morning! Thanks for sharing at #HomeMattersParty hope to see you back! So yummy, quick and easy! My boys would gobble these up. Pinned. These look delicious! 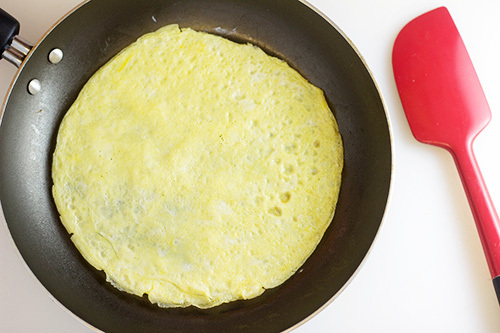 So smart to cook the egg all in one piece – much less messy! Thank you for sharing on Family Joy Blog Link-Up Party. Hope you are having a great week! This is a great idea! We love simple to-go breakfast ideas in our house! Ah, I see what happened here. You must think all sliced cheese is made by Kraft? Actually, this cheese is made by Sargento. 100% real, natural cheese slices. Super good stuff. You should check them out. Oh, and just because I used Sargento for this recipe, doesn’t mean we don’t use Kraft. We use that sometimes too. Have a great day! Looks delicious! Thanks for linking up with What’s Cookin’ Wednesday! These look amazing, and the pictures are beautiful. Will have to try these out. Thanks for sharing! This might sound strange in this day and age, but I wish I’d had this recipe when my kids were little, we never even thought of using tortillas for anything but enchiladas or making Mexican dishes. These look delicious! And perfectly rolled. 🙂 With a two year old, I understand picking up sticky egg off the floor. We, too, are a breakfast burrito family. I make a batch of twenty or so and store them in the freezer. This would be an excellent variety, and a great way to add some spinach for breakfast. Thanks for sharing the recipe. Gorgeous photography too! This is brilliant! I have a confession to make and that is that I love McDonalds Sausage Burritos, but have that fall-apart problem you wrote about. I would love to try this for my on-the-go breakfasts next week! Thanks for the inspiration! These are PURE genius!! My kids would LOVE them! Thanks Brandie. I am always looking for fresh new ideas for breakfast and/or dinner. I can’t wait to try this recipe. LOVE your blog! Thanks! Looks great and so simple that teenagers could make their own. Those look delicious! I can’t wait to make them for my family. Your Breakfast Roll Ups are fantastic! Thanks so much for sharing your awesome post with Full Plate Thursday and hope you have a great week! I love it – thanks for sharing and linking up with us at the #WWDParty. Great idea to use cook the eggs that way. So much easier to roll up into a mini burrito. Pinned. Would love it if you share this on Merry Monday Linky Party. I’m stopping by from the Time to Sparkle link party. I’m seriously impressed with how uniform that egg is cooked! I’m going to try it. I make my kids breakfast burritos with scrambled eggs, but they don’t roll up nice and neat like this. Thanks for the visual 🙂 Pinned! These look delicious! And simple to make! 🙂 Thanks for sharing!! I never would have thought of that with the egg, Brandie! You just store them in the fridge if you make them the night before? Can they be frozen? Probably gross if you add a leafy veggie, huh? I love this idea. I struggle to come up with things to put in my tortillas so I usually end up with chicken and salad most of the time. Never thought of having them with breakfast before. I love being able to eat veggies with every meal, so this is a perfect breakfast for me. This looks really easy to make and a great start for the day too. Lovely breakfast idea! omgosh, I LOVE these!! What an awesome idea and I love how you solved your egg issue. Pinning for future reference (and to make and link to you)!! I noticed a “typo”: “Don’t go crazy thought”. Ha, thanks Craig! I’ll fix that. And thanks for the compliment on the Breakfast Roll-Ups. You’re welcome, I might actually make them. I love the idea of making the thin eggs like that! 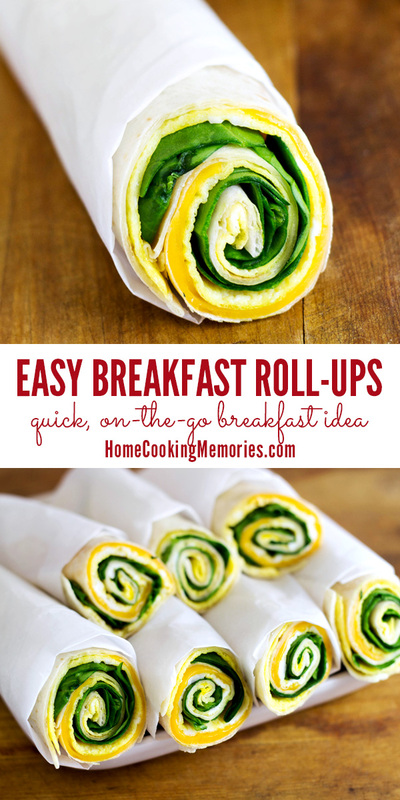 I do the same kind of eggs for fried rice, but now I’m definitely going to try these breakfast roll ups!! What a clever idea to keep everything together, and beautiful colors when you cut them in half! Hubbyman would love these in the morning!